The International Food and Drink Event 2019 (IFE 2019) took place at the Excel centre in London earlier this month, showcasing 1,350 innovative and global food and drink manufacturers and their wares. Verdict Foodservice explores the five things we learnt at this year’s event. Water was a prevalent beverage at the event, with many exhibitors showcasing different types of smart waters enhanced with properties they claim can help the human body. One, EauLab, launched its product at the event focusing on specific health and wellness benefits. It incorporates fibre and claims to offer immune system support from turmeric, muscle recovery using plant-based protein and energy from jitter-free guayusa, a caffeinated holly tree from South America. Another company promoting its water range was Vieve Protein Water. Aimed at the sports nutrition market the water-based protein drink has zero sugar and dairy and contains 20g protein in each bottle. Keynote speaker Diageo head of on-trade development Sarah McCarthy spoke about the evolution in cocktail trends, one of them being cocktails on tap. McCarthy said: “There is certainly a demand in the trade for draft cocktails, be that to provide consistency, ease of serve or just to offer something different on the front bar and capture people’s attention. Frizzenti is a permanent bar concept that also serves cocktails on tap at different locations across the country. Another cocktail concept seen at the event was frozen cocktails. 24 ICE has developed a range of cocktail-flavoured popsicles for consumers. Flavours include Mojito, Strawberry Daiquiri, Limoncello, Pina Colada and Vodka Energy. Based in the Netherlands, the frozen cocktail maker hopes to bring the new concept to the UK soon. Vegan products were one of the biggest trends at IFE 2019 with exhibitors showcasing a wide range of vegan-friendly products. A survey of 216 members of the IFE network in December 2018 showed plant-based eating is a trend that has grown from last year. One of the vegan concepts that came from the show was vegan rocky road bars created by family-run business Mummy Meagz. The vegan kitchen was launched in January 2017; its products are free from 13 of the 14 major allergens as well as being registered with The Vegan Society and Coeliac UK. According to figures from the Wine and Spirit Trade Association (WSTA), gin sales in the UK were up to £1.9bn in 2018 and 66 million bottles were sold in a year. In the last recorded 12 months, almost three-quarters of the flavoured gin category growth was due to pink gin. Gin distributor The English Drinks Company was at the event to showcase the launch of its new citrus Lemon Grove gin. Other flavours the company distributes include orange, pink and its signature flavour cucumber. The English drinks company made its cucumber gin to compete in the market of flavoured gins and meet consumer demands for flavoured gins. 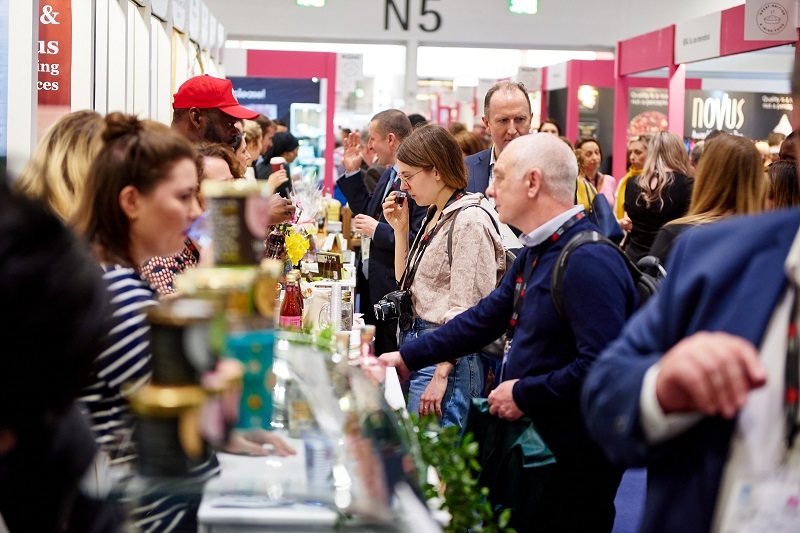 Sugar-free foods and drinks proved a big pull for health-conscious customers at IFE 2019. One of the exhibitors at the event, Lickalix, was showcasing its range of natural healthy ice lollies, free from lactose, dairy, gluten and nuts. Launched in London in 2014, Lickalix uses real fruit with natural and organic ingredients to make the fruit-flavoured lollies. ThreeWorks was another exhibitor at the event showcasing its Apple Chips natural apple chip snacks, which are sugar-free, gluten free and vegan-friendly, tying in with the some of the biggest trends that were seen at IFE 2019.